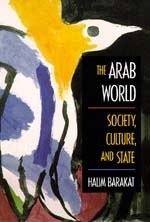 This wide-ranging examination of Arab society and culture offers a unique opportunity to know the Arab world from an Arab point of view. Halim Barakat, an expatriate Syrian who is both scholar and novelist, emphasizes the dynamic changes and diverse patterns that have characterized the Middle East since the mid-nineteenth century. The Arab world is not one shaped by Islam, nor one simply explained by reference to the sectarian conflicts of a "mosaic" society. Instead, Barakat reveals a society that is highly complex, with many and various contending polarities. It is a society in a state of becoming and change, one whose social contradictions are at the root of the struggle to transcend dehumanizing conditions. Arguing from a perspective that is both radical and critical, Barakat is committed to the improvement of human conditions in the Arab world. Halim Barakat is Research Professor at Georgetown University's Center for Contemporary Arab Studies and author of Lebanon in Strife (1979). His several novels in Arabic are widely read in the Middle East. Two novels, Days of Dust and Six Days (1983 and 1990), have been translated into English.